Stock markets are close to all-time highs on the back of Assembly election results. Further gains look unlikely. In the past one year, Pramod Gubbi, Head, Equities, Ambit Capital, has reduced his monthly investment in equity mutual funds by 75 per cent. "Fundamentals don't support valuations. It's not a cheap market. We have suggested to our investors to book profits and enter when markets correct." But markets don't seem to be obliging Gubbi. 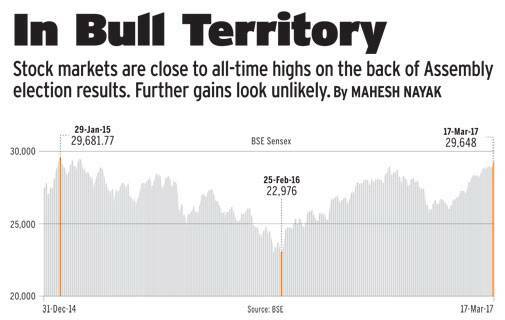 The main stock indices hit a 52-week high on March 17, when the BSE Sensex, at 29,824, was at a two-year high, just 200 points short of the all-time high of March 5, 2015. "Fund flows, sentiment and fundamentals are working in favour of markets," says Nilesh Shah, Managing Director & CEO, Kotak Mutual Fund. He says three events - note ban, Union Budget and state elections - considered risks a few months ago have turned out well. The impact of the note ban fizzled out by January, the Budget stuck to fiscal prudence, while elections strengthened the hands of the government at the Centre. "The sentiment has improved on the hope the government will be able to deliver on labour reforms, improve the ease of doing business, recapitalise banks and improve the NPA situation," he says. For now, the market is riding on the back of strong fund inflows. In 2017, FIIs have invested $3.7 billion, while mutual funds have pumped in close to $1 billion. Gubbi says the rise is not supported by earnings growth and so is risky. Abhay Laijawala, Head of Research, Deutsche Equities, agrees. "Over the past few years, in the absence of earnings growth, markets have not been able to break out from levels where valuations are over 17 times earnings. Despite the liquidity, it will be difficult for markets to sustain at these levels without support from earnings growth." "Even for 2017/18, consensus earnings growth estimates have come down from 26 per cent to 18 per cent. My guess is that by the time the GST is implemented, the estimates will fall to 10-12 per cent. We should not chase markets in such an environment," he says. Global events can cause hiccups but may not have a major bearing on our markets. "With domestic flows remaining strong, my concerns are that they should not push the market in the overvalued zone. Mutual funds are receiving `4,000 crore every month through SIPs. For the first time in my 25 years in the market I am praying that FIIs should play the role of a balancer and turn sellers. Otherwise, with limited supply and sustained inflows, our markets can be on fire."